In November of 1914, the once-mighty “sick man of Europe,” the Ottoman Empire, entered the war to end all wars as a Central Power. Having concluded a secret alliance with Germany against her long-time rival Russia, the conditions for war were met, and on November11 Sultan Mehmed V declared jihad. As with so many other empires, the jump into war would prove to be the downfall of Turkey as a Mediterranean power, and in fact as an empire at all. The terms of their alliance with Germany pulled the Ottomans into the war, but the real question remains: what led them to sign it? The answers can be found in two places: the Berlin-Baghdad Railway, and the arrival of the SMS Goeben. The terms of the Ottoman-German Alliance were simple; the treaty’s impetus came mainly from German investment and the technical advice of Generalleutenant Otto Liman von Sanders (as well as German Weltpolitik). It was signed during a secret ceremony on August 2, 1914. In the event of Germany coming to the aid of the Hapsburg Empire against Russia, Turkey would also join against Russia (this was of course already the situation when the treaty was signed). From the outset, the treaty’s legitimacy was in question: preferring to keep the empire neutral during the Great War, the Sultan refused to sign. As Mehmed was Commander-in-Chief of the Turkish forces, it was believed to be a potential crisis until he devolved his war powers upon the cabinet It was they who would actually conduct the war. The Black Sea was for all intents and purposes devoid of a Russian fleet, and Britain began to lose interest in the Near East. This region held the crucial Dardanelles, the narrow strait linking the Black Sea to the greater Mediterranean. The void would be filled by Germany, which had new designs on Turkey. In 1889, German financier Georg von Siemens of the Deutsche Bank came up with a proposal for an ‘Imperial Ottoman Baghdad Railway.’ The railroad, traversing a Berlin-Byzantium-Baghdad route, would extend the existing Haidar Pasha – Ismid Railway to Ankara to start. Following a favorable meeting between the Kaiser and the Sultan, the latter approved the venture. Over the first ten years of the project, a line was built across Anatolia, and in 1899 the Sultan consented to the next phase of the project. At this point the Germans needed more investment capital, and French and English financiers were approached for it. They declined to participate. The French bankers were in favor, but Paris was opposed. In Britain, the situation was reversed, with Parliament supporting the project but the Square Mile in opposition. The City and Versailles carried the day. 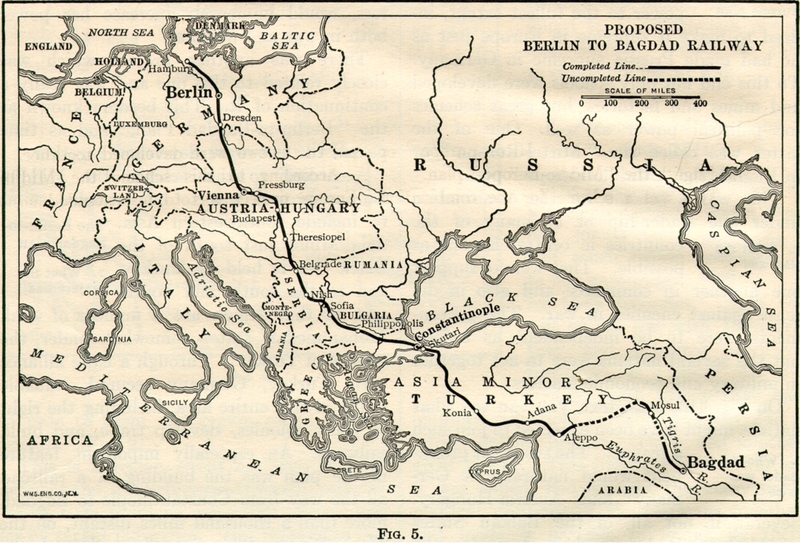 The Entente powers also put pressure on the Russians to remain uninvolved in the railway project. In 1903, a line to Basra was on the table for the British, whose considerable oil interests would have benefited from such an extension. The British, though, would have had only a 25% interest in the venture versus a 35% German one. The right-wing National Review and The Spectator quickly registered their opposition, and the British pulled out. By 1910, the situation had changed. Russia was now amenable towards the project and had plans to extend it to Tehran and much of Southern Persia. The Baghdad Railway, in addition to providing a simple transportation route (with the Orient Express as a baseline), would also provide a direct pipeline from Germany to its Middle Eastern interests. Were the railway to be completed, British control of the Mediterranean would be irrelevant, and Berlin would enjoy an uninterrupted direct flow of oil. London was beginning to understand the importance of the oil in the region. Already 25,000 tons a month were being imported from Persia. While not possessing the fantastic strategic importance it would hold in only three or four years, the British were growing wise to the its potential. They managed to negotiate German shares in the oil companies near Basra down to 25% at the most, securing – if not favorable rates – then access to the oil itself. With the newly upgraded railway, the Ottomans would have excellent mobilization capabilities on the Balkan front – something that Moscow was not particularly thrilled about. Complementing the existing Franco-Russo alliance signed in 1893, and the Entente Cordiale between Britain and France, an Anglo-Russo understanding was reached in 1908. The pact would come to be known as the Triple Entente – a three-way alliance between Britain, France, and Russia. Sultan Osman I, renamed HMS Agincourt. In the late summer of 1914, the Turks were still waiting to receive two dreadnoughts previously ordered from Britain. With the advent of the war, the Admiralty requisitioned them and paid the Turks for their trouble. The two ships were among the best in any navy, and the Sultan Osman was the single most heavily armed battleship in the world; the Ottomans were rightfully perturbed at their loss. Constantinople’s indignation at such a British insult was not confined to the light-skinned world of diplomatic relations. Before long it would be obvious just what the two warships had cost London. With a framework for entry into the war, the SMS Goeben’s arrival off of Istanbul was the final catalyst of Turkish belligerence in World War I. As the war began to unfold, Germany’s Mediterranean Squadron, consisting of the powerful battlecruiser Goeben and light cruiser SMS Breslau, were visiting Haifa in the Eastern Mediterranean. Upon receiving news of the archduke’s assassination in Sarajevo, German Rear Admiral William Souchon made for the Austrian base of Pola, and from there, considered whether or not to force his way out through Gibraltar and into the North Sea, where he could join with the High Seas Fleet. Based on the deteriorating condition of Goeben’s boilers, Souchon opted for the Dardanelles. Following a brief, mismanaged, and ultimately “cowardly” pursuit and withdrawal by the Royal Navy, Souchon received a communique from the German embassy in Constantinople. The Turks were reluctant to actually enter the war, and the ambassador wanted pressure applied. 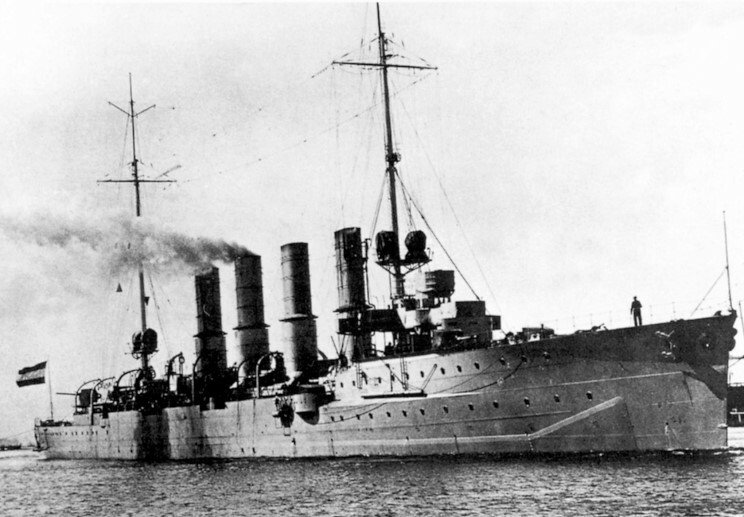 The sight of Goeben anchored off the Golden Horn was thought to be an excellent form of persuasion. On August 13, Souchon’s Mediterranean Squadron reached the gates of Constantinople. A grand ceremony followed three days later, in which Goeben was rechristened Jawus Sultan Selim and Breslau became Midilli. The German crews were issued fezzes and Admiral Souchon elevated to “Commander-in-Chief of the Ottoman Navy.” When the British protested such a blatant flaunting of neutrality, the Turks responded by claiming that the sailors of Midilli and Selim were Turkish crews – they wore fezzes, worshiped on Friday, and in any event, the best Turkish sailors were still in Britain, waiting for their new dreadnoughts that would never come. For the next three months, the ships would remain tacitly at anchor off of Constantinople. 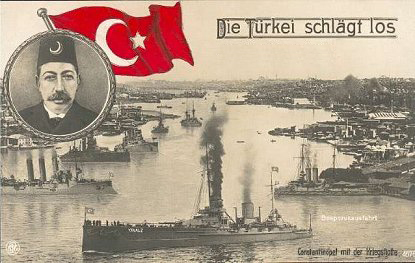 German postcard of the Ottoman Navy at the Golden Horn, 1914. The Ottoman Empire was at war with the Allies. Her navy possessed one of the most innovative and creative tacticians at sea, a man known for his “self-control, cheerfulness, versatility and capacity for hard work.” Russia had been cut off from the Allies. With the Black Sea and the Baltic cut off from Allied shipping, she was dependant on the ice-bound port of Archangelsk for her supplies (contributing heavily to her later collapse in 1917). The Allies (particularly Britain) would have to divert significant manpower and other resources better deployed on the Western Front. The Baghdad Railway created the Ottoman-German Alliance, while Goeben forced them to honor the agreement. After the war, Winston Churchill provided a summary of Goeben’s role throughout history, “for the peoples of the East and the Middle East,” he said, Goeben carried with her “more slaughter, more misery, and more ruin than has ever before been borne within the compass of a ship.” It would not be mere hyperbole to postulate that ship and train alike bear at least some reponsibility for the Russian Revolution, World War II, the Armenian Genocide, and all the other horrors of the twentieth century. The Ottoman Empire may have ceased to exist by 1918, but the repercussions of her entry into the First World War are still felt today. John Keegan, The First World War (New York: Random House, 1998), 217. Niall Ferguson, The Pity of War: Explaining World War I (New York: Basic, 1999), 143. Ferguson, The Pity of War, 51. James Joll, The Origins of the First World War (Essex, UK: Pearson, 1992), 186. Joll, The Origins of the First World War, 187. Norman Stone, Europe Transformed: 1878-1919 (Oxford: Blackwell, 1999), 112. Keegan, The First World War, 216. Robert K. Massie, Castles of Steel: Britain, Germany, and the Winning of the Great War at Sea (New York: Ballantine, 2003), 28-29. Massie, Castles of Steel, 34. Massie, Castles of Steel, 48. Keegan, The First World War, 217. Robert O’Connell, Of Arms and Men: A History of Weapons, War, and Aggression (New York: Oxford University Press, 1989), 246. Dan Van der Vat, The Ship That Changed the World: The Escape of the Goeben to the Dardanelles in 1914 (Bethesda, Md. : Adler & Adler, 1986), 35. Massie, Castles of Steel, 50. Actually, the Goeben was “responsible” for nothing. Winston Churchill – class A warmonger, bloody imperialist, and genocide artist – on the other hand, was one of the principal human instigators of the entire 1914-45 World War.